Butler Farms adds tree nuts to their line-up of crops. David Butler of Butler Farms harvested his first hazelnuts last year. The farm is working hazelnuts into their 2,000-acre operation, which includes grass seed, peppermint, corn and beans. Five years ago, Butler Farms started making room for hazelnuts among the grass seed, peppermint, corn and bean fields. 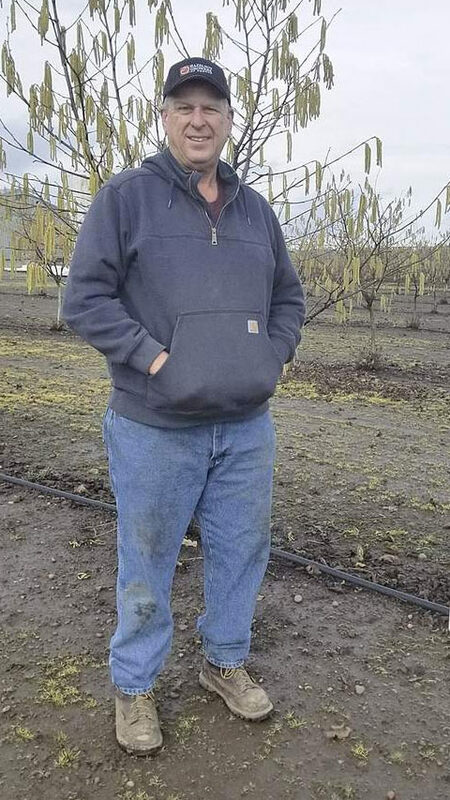 Brothers Gary, Tim and David Butler began replacing a little of each crop on their 2,000-acre family farm in the Stayton and Aumsville, Ore., area with hazelnuts. After three years the farm had 140 acres of hazelnuts. “Now we’re taking a break to get some return on our investment,” David Butler said. The week after the Butlers planted their first group of 24-inch trees temperatures plummeted to zero degrees Fahrenheit. They experienced a 20-25 percent die-off. With the variety of crops, harvest season spans July through October with few breaks. “We learned to work hard as kids, so we just carried that on,” Butler said. “They keep saying we need more volume and more nuts to be a major player in the market; that you need the supply before you can create a demand,” he said. Brothers Tim Aman of Hazelnut Growers of Oregon and Tom Aman of Wilco Valley Ag provide valuable advice. The two are experienced hazelnut growers and propagators on their own farm. “We buy our trees from them,” Butler said. “Because of their experience I take their advice very seriously. I see the success they have and if I could do that I would be extremely happy. The new blight-resistant hazelnut cultivars developed by Oregon State University are especially partial to the Willamette Valley. To get in on the action larger players are showing up. “You’re seeing a lot of the big corporations come into the valley and invest in hazelnuts; whether that’s good or bad I don’t know but it’s happening,” Butler said. Setton Farms of Terra Bella, Calif., is one of America’s largest pistachio growers. It also markets some 4 million pounds of hazelnuts every year, buying them from Turkey. “They decided they need to be in the business themselves,” Butler said. “They bought land a stone’s throw from our place and put in 200 to 300 acres last spring. Their goal is around 1,500 acres.